Discussion in 'Trials' started by nevgriff64, Aug 28, 2011. Lets see if we can come up with a better solution to sell our unwanted "TRIALS" items. We already have our main Flea Market Forums for Bikes, Parts, Equipment ETC. If you wish to submit an add in those forums and place a link here to those items of sale, you will then have the luxury of placing as many photos as you wish or answer any questions/comments that may arise in "YOUR" thread. IF/WHEN your item/s sell, please edit/delete your post in this thread. Because our Trials Flea Market is only the one thread to sell all trials related items, we really need to keep the comments/questions/remarks out of it so we don`t have a cluttered up mess. Please try and keep photos to a maximum of two, you can supply more via pm if an inmate requests more or link them and remember to delete your add once the item has sold. I`ll do a clean out of old items every now and then so if you still have an item up for sale and it has sat longer than a week or two, bump the add and delete the original. I appreciate your efforts in helping to keep the Trials Forum the best forum on ADVRider. Just a reminder to everyone - Normal Flea Market Rules apply here as well. Your ad MUST have a price and a location. We don't do Auctions or "PM with highest price" type sales here. No links to outside ads etc etc. troy safari carpente and REALGRAVEROBBER like this. SO WE DON'T END UP A MESS AND NEED TO WEED OUR WAY THROUGH ENDLESS DISCUSSIONS TO FIND THE TREASURES - THE FLEA MARKET THREAD IS NOT TO BE USED FOR POSTING COMMENTS. PLEASE CONTACT THE INMATE DIRECTLY TO NEGOTIATE/ASK QUESTIONS/GIVE ADVICE. All the nifty GP parts: carbon reeds, Tech gold forks, specially tuned Ohlins shock, lightened triple clamps, carbon airbox, etc. New parts are plentiful and include sprockets (Jitsie), chain (Renthal R1), chain tensioner block among others. Located in MA, Stu can vouch for the bike and offer low cost crating and shipping. Norman Foley, Kiharaikido, laser17 and 4 others like this. Bronco638, DyrWolf, Brewtus and 2 others like this. Do you still have tht Bultaco? Posted in the Flea Market, but cross posting it here too. Still for sale, but at the new low low price of $1000. Come get it. Xiu clutch for GG: friction plates, steels and fingers. $100. I have a new in the box Jitsie HT2 Kroko in size Medium for sale. I bought this last year and it did not fit. The store here in the USA that I bought it from said since I tried it on in the house for 30 seconds that they would not take it back. Not sure how you would know it fits without trying it on. Anyways it is time to get this out of the shop. I paid $200 for it and I would let it go for $165 with free shipping. I would entertain offers as well. On ebay - Red Gas Gas TXT pro (early - 2008) fenders front and rear nearly new. 2005 290 Sherco, low hours on new fork bushing and new seals, Jitse forged levers, aluminum slow throttle tube, just rebuilt carb, new carb/air cleaner rubber doohicky, new gas petcock, Ohlins rear shock. Runs good. $2200.00 I'm close to Culpeper Virginia. Adding Ad to this thread....Great bike in fantastic condition. I haven't owned long--wife says five bikes too many. Runs like a top. Only 1,845 miles. Recent tires and battery. An '86 model just sold on Mecum for $3,500. Asking $2,300. Loacted Peachtree City, GA.
DyrWolf and Kiharaikido like this. I bought this bike in 2016 and it had never been off road. Was just like a left over new bike. Lots of extra bits and carbon fiber guards. Ready to ride needs nothing. More pictures and details on request. fprintf, Kiharaikido, DyrWolf and 1 other person like this. New bike on the way Scott? 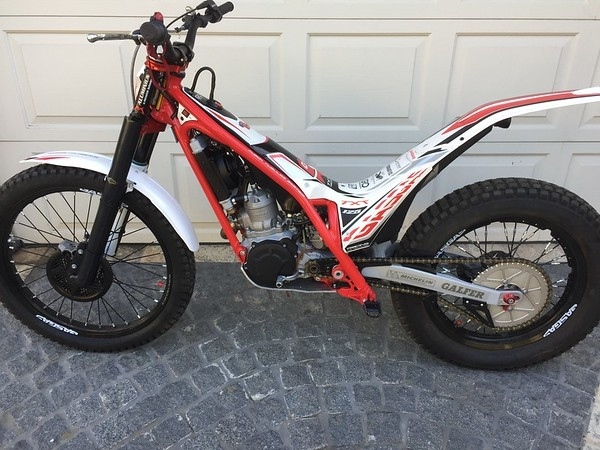 2015 GasGas TXT Pro 125 for sale $4500. located in Burbank Ca. lots of extras: frame, linkage exhaust and silencer guards. S3 lever quick adjusters, Jitsie carb quick adjusters. S3 #5 bar ends. Brewtus and jonnyc21 like this.